Why don’t we talk about Arthur P. Schmidt? While scrolling the archives of the Sheet Music Consortium to find fodder for this weeks blog post, I found myself a bit at a loss. For the past few classes we’ve begun to study early American art music and I was hoping to find some manuscript of Amy Beach’s or Edward MacDowell’s to put on display. While I did find scores from both composers, what I found more compelling was the name at the bottom of nearly every score I examined. No, not Mrs. H.H.A. Beach like you see on the right, but rather Arthur P. Schmidt. This name appeared on several scores of both Beach and MacDowell. Who was Arthur P. Schmidt? Why does his name get to be on an exorbitant amount of the music published in 19th-century America? And why should you care? Musical scholarship often focuses on the narratives of performers and mostly of composers, but equally important to these artistic forces were the business people that helped create the music industry. Figures like Theodore Thomas helped define the idea of a duality between art and the free market. Arthur P. Schmidt, while not a conductor or music director, was a music publisher. The publishing side of the music industry became increasingly important as the 19th century marched on. Soon, the publishers of Tin Pan Alley would help define American musical tastes.Arthur P. Schmidt, too, became a taste-maker of sorts. In fact, Douglas Bomberger states in an article about Edward MacDowell and Arthur Schmidt that the later 19th century became known as the “Golden Age” of music publishing in America. 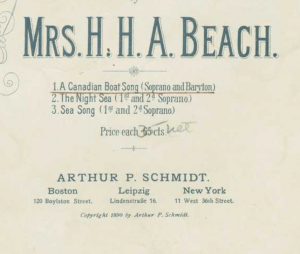 Schmidt’s Boston based publishing company would come to publish nearly the entire compositional body of Edward MacDowell and feature several compositions by Amy Beach. In total, the Boston office had printed over 15 000 titles. 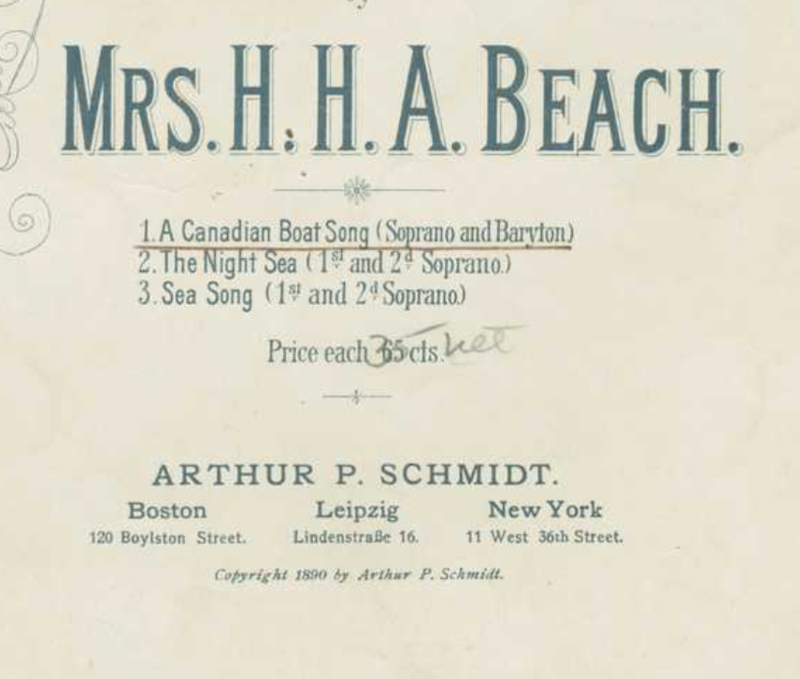 The publisher Arthur P. Schmidt, when searched in the Sheet Music Consortium, comes up with over 4,000 results. The guy was really popular. But why don’t we hear about him? In Richard Crawford’s American Musical Life, there is an entire chapter devoted to the music of Edward MacDowell, but it never once mentions the way MacDowell’s music got published. In the scholarship this class has read about the music industry of mid to late 19th-century American art music, there has been little discussion of the way music publishers shape the reception and transmission of famous musical works. Money and music have never been as separate as we want them to be. The influences of capitalist market demand have no doubt shaped the way we consume, study, and participate in music. According to the New Grove Dictionary of Music and Musicians, the Arthur P. Schmidt company grew so popular that it opened an office in Leipzig, Germany. What impact did the transmission of American composers like MacDowell and Beach have on American and German cultural interactions? How did these relationships develop during the first world war? How did music publishers influence understanding of American musical culture? Music publishing is still and must have been incredibly important. So why isn’t it talked about more? Personally, I think that this hesitancy to acknowledge the codependency of music and capitalism results from our societies binary system of thinking. The notions of artists and business people are often seen as contradictory by most of the public. We don’t want our art to be infected by money. But, like everything in life, it most definitely is. A complete understanding of American musical life demands that we consider not only our beloved composers and performers, but the hardened business people responsible for shaping our musical tastes. Including examples of music published by someone like Arthur P. Schmidt in an exhibit about America’s music, for example, could help prompt further questions about the codependent relationship between music, money, and American markets. Bomberger, E. Douglas. “Edward Macdowell, Arthur P. Schmidt, and the Shakespeare Overtures of Joachim Raff: A Case Study in Nineteenth-Century Music Publishing.” Notes 54, no. 1 (1997): 11-26. doi:10.2307/899930. Cipolla, Wilma Reid. “Schmidt, Arthur P..” Grove Music Online. Oxford Music Online. Oxford University Press, accessed October 24, 2017, http://www.oxfordmusiconline.com/subscriber/article/grove/music/24937.